In place of a coffee table, consider a storage footstool. The latter is coffee table and comfortable footrest in one, plus the lift-up lid reveals capacious storage inside. If you need a desk in a small living room, opt for a narrower console table instead. It’s more than enough desk space for a laptop and, when you’re not working, it can be used for table lamps and display. Think about positioning it behind a sofa as an alternative to against the wall, freeing up space around the sides of the room for other furniture. Choose upholstered cubes that work as both occasional tables or extra seating as required. They’re easy to slide away under a console table or alongside seating when not in use. Individual storage furniture designs such as a bookcase, a TV unit, a cupboard for films or music, etc, can fill up a small living room, making the seating area cramped. Instead, swap the whole shebang for one combination of shelving, drawers and cupboards along a wall that’s home to all your stuff. With the room’s storage taking the form of a single piece of furniture, don’t be afraid to go high for this element as it won’t prove overpowering. The least frequently used items can be kept at the top. If you have items you don’t want on display to stow in the living room, look for modular designs that allow you to put together the combination of open and closed storage that suits what you need to store. Look, too, for designs specially made for small spaces that might include features such as a pull-down desk or other useful extras. It’s not just which pieces you choose that’s important in a small living room. Their shape and material can also help make the space feel larger. Look for furniture you can see beneath whether that’s a sofa or armchair, bookcase, footstool, and so on. More floor on show equals a more spacious impression. Look, too, for slim legs on these designs rather than bulky feet. Metal legs for seating or side tables are stylish, or try Mid-century inspired tapered wooden legs. Pay attention to the overall shape of items such as sofas and armchairs. Scrolled arms demand space that isn’t going spare in small rooms and intrude into circulation areas. Look for slim, upright, squared-off arms. The same goes for cabinet furniture. Opt for neat uprights rather than curvaceous outlines. Look at the depth of seat cushions and angle of the back of seating. A more compact and upright seat can be equally comfortable and leave room for a coffee table in front where a slouchy design is a space-guzzler. When it comes to selecting armchairs check out those designed for bedrooms. These may have more petite proportions while still proving comfy. Alternatively, an armchair with wooden rather than upholstered arms has a see-through element that makes it a good option for a small room. There are some fabulous 1950s inspired versions on the high street and online. 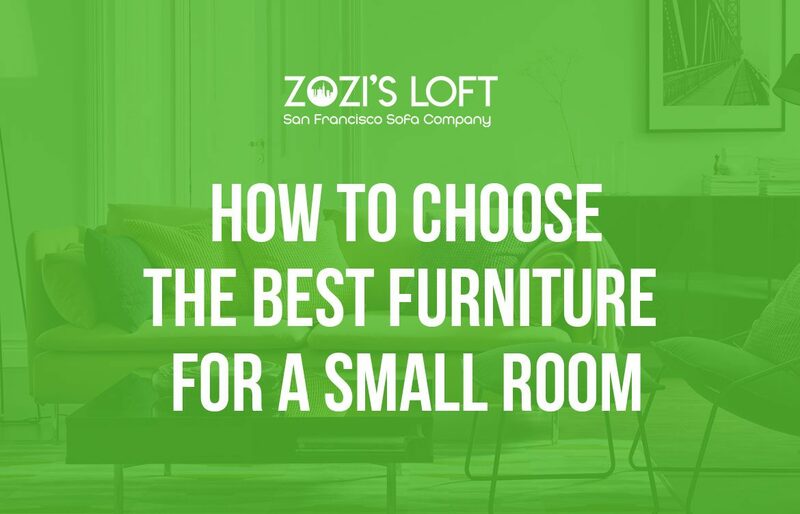 If you’re incorporating wood furniture, be aware that dark woods can look heavy in a small room where the same size piece in a light wood is visually less imposing. Painted wood or MDF cabinet furniture in white, cream or light grey is also a space-stretcher. Consider shelving painted in the same shade as the wall behind so it disappears into the background. For occasional tables materials such as glass or acrylic can lessen their impact without reducing utility. An acrylic side chair is also handy as extra seating that doesn’t seem to fill up the room. If you want to make a small living room feel bigger without compromising, consider these small space favourites. A corner (L-shaped) sofa could prove more space-efficient than a sofa and chair combination as there’s only one piece of furniture to fit rather than multiple designs with space needed in between. It can work in a narrow room or in small square or rectangular areas. Sofa not fitting at all? Try a love seat for the same look and room for two to snuggle but more diminutive dimensions. Window seats aren’t just for country homes. Opt for a freestanding version with storage underneath to make something out of otherwise dead space. Pick furniture you can arrange symmetrically for a small room. A sofa and coffee table placed centrally with side tables either side will feel ordered and attractive rather than cluttered.